List of machines used for professional and personal endeavors from 1972 to the present. Royal manual typewriter, the R. Waters Memorial AP press-room machine acquired during a beer-soaked deal at the Why Not Lounge and used at Cardinal Associates in Charlotte, NC. It has the AP Property# stenciled on the side. It fell off a U-Haul and is irreparably frozen in time. Now ignobly rusting in the toolshed. 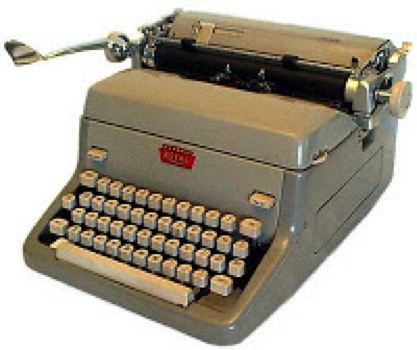 IBM Selectric (a runaway train with interchangeable spinning golfball and fixed platen; sleek, fast as a hit of speed; once owned one in British racing green and wish I’d kept it for its Jaguar looks). IBM TSO 3270 terminal, and primitive text editor, working off an oversized HAL mainframe in TX (Fluor). DEC VAX UNIX terminal, and RUNOFF text compiler (first in-office terminal, i.e. not shared; came on a wheely cart with fifty pounds of cabling spaghetti and a blinking modem; used happily at Western Geo in Houston circa 1984). Apple iie with add-on’s and WordPerfect (first home computer purchase, at such an exorbitant price I financed it like a car); tank-like but with little memory, two floppy holes, and a green-lettered 40-character screen, later expanded with an 80-column card. Brother Electric typewriter (backup writing machine in the 80s, suitably noisy but a workhorse. Traded it to a dental assistant for a free cleaning. IBM SPF 3278 terminal, and ISIL code (on-site at an IBM contract gig; the PF keys and weird red-starry-green displays proved more confusing than ever). Epson – IBM PC clone, w/WordStar (at an IBM contractor company; the PC was garbage, as was the gig). Data General, CEO word processor module (off the mini, at the Travelers software company; a stodgy system but intuitive; had a comfy-clunky keyboard). IBM XT, w/WordStar (a 2-hole floppy disk special, grinded gears and groaned all day; it did, however, have a nice, tank-solid keyboard; se habla DOS aquí). IBM AT, w/WordPerfect on an actual LAN (faster, but all that coding in WP using f-keys was painful, and keyboards were going lightweight, like typing on plastic hollow box). Macintosh SE, w/Appleworks (FlightSafety’s tool of production – as required by our main client FedEx – and a damn good one in most respects). iMac G4 – Lollipop model, aka Lampstand, 14″ on swivel stick w/hemisphere base, circa 2003, retired 2011 and stored in the backroom closet as a museum piece. Macbook Pro – reliable laptop backup and mobile unit. iMac desktop (have had 2) – present workhorse, an aluminum 21″ slab with a simple wired chiclet keyboard. I’ve worn out the lettering on the S key. Otherwise durable, having endured food crumbs, sneezes, irate text-pounding, and beer spills. Posted in Writers' Corner on July 6, 2014 by Wm P.